The Sea Museum is located in what was once the principal building of Trieste's first lazaretto (quarantine station). 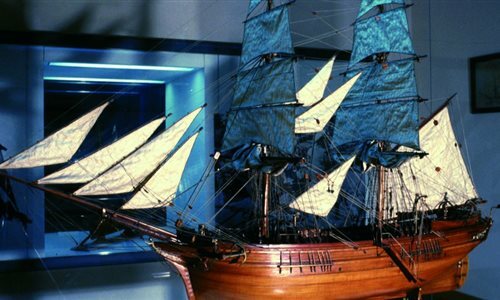 The Municipality of Trieste informs that from Monday 1 April the headquarters of the Civic Museum of the Sea in via di Campo Marzio is closed to the public to allow the activities of reconnaissance of the assets, verification and evaluation of the single finds, preparation of documentation and programming of transports for the transfer of the collections to Magazzino 26 of Porto Vecchio. It should be remembered that the headquarters of the Civic Museum of the Sea of Magazzino 26 of the Porto Vecchio, dedicated to the "Lloyd on sight storage" section, is already open to the public, open for free on Friday, Saturday and Sunday, from 10.00am to 7.00pm. Due to the richness of its collections, it is one of the leading museums of its type in Italy and the Mediterranean. Visitors have the opportunity to admire models of all the different vessels that have contributed to the history of navigation, including boats dug out from tree trunks, Roman triremes, Venetian galleys, Christopher Columbus's caravels, galleons, sailing ships, brigantines, frigates, large-scale models of Trieste's nineteenth-century navy ships and Lloyd Triestino steamers, as well as twentieth-century hospital ships and sailing yachts. A room is devoted to Guglielmo Marconi's ship Elettra and there is even the telegraph key that was used to send the first telegraph transmission. In an adjacent room, visitors can admire a few of the propeller prototypes used in the first experiments conducted in Sacchetta by Ressel, the inventor of the propeller. Another interesting exhibit is the unique collection of dioramas on fishing, explaining historic Adriatic fishing methods through countless models of fishing boats of differing origins and uses.